Bed bugs are a serious issue in the pest control industry. Different companies have different approaches to addressing the problem. At EnviroTech, our thorough and rigorous inspection process means that we check multiple areas throughout your home. Before you call us, however, there are a number of steps you can take on your own to help determine if bed bugs really are the cause of your concern. 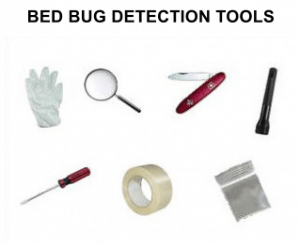 Below, you’ll find a list of the tools you’ll need—the same ones we use in our professional inspections—as well as some telltale signs that indicate the presence of bed bugs. Next up in our Bed Bugs Blog Series, we’ll discuss proper inspection methods and techniques for the most common area of infestations—the bed—and beyond.